Toyama is known for its rich source of water and widely available electric power. So, we take advantage of these energy. Therefore, heavy and chemical industry have developed and grown to be one of the best Industrial Complex areas on the sea of Japan side. 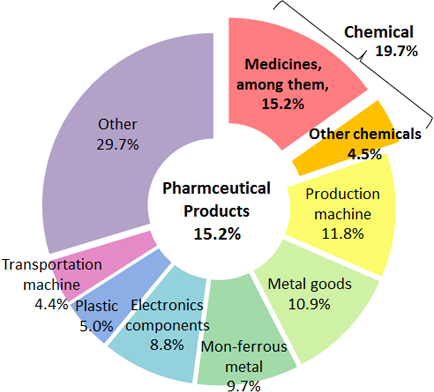 Among these industries, Pharmaceutical production occupies 15.2% of the total industrial production in the prefecture, so it is the key industry in Toyama. In 2016, total amount of pharmaceutical production was 622 billion yen and it was first place in Japan. 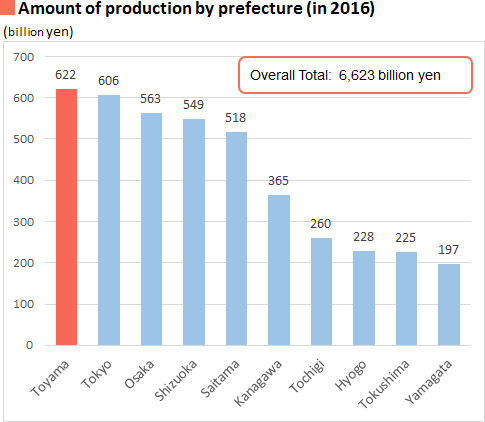 Toyama ranked first in Japan by amount of money of pharmaceutical production, number of the plant, and number of employees who engage in the production per unit of population. The base of the pharmaceutical industry in Toyama was constituted by the "Drug for household delivery business" with the 300 years history and its tradition. Its proven achievements have established pharmaceutical production companies and improved their quality and techniques. It has been widely accepted with high-reputation all over Japan. Moreover, industry of wrapping papers for medicines and paper balloons (as freebie toy) that were given for kids of the customers have grown with the development of pharmaceutical industry. Then the printing (print art) companies of those paper goods has grown with it. Followed by those, related businesses, such as industries of aluminum tubes and plastics for medicine container, have also developed. In the Meiji period, when modern industry started, the pharmaceutical industry contributed a lot for modernization of industries in Toyama prefecture, such as banks, electrical companies and pharmaceutical companies, based on its capital from "drug for house hold delivery" and knowledge that has accumulated. At the same time, the pharmaceutical industry also fulfilled big role for education by enhancing development of human resources. It established Kyoritsu pharmaceutical school (forerunner of department of pharmacy in Toyama University). That is why it is known for the "Roots of Toyama". Pharmaceutical production industry in Toyama has well developed with expanding generics and commissioning manufacture since 2005, when the revised Pharmaceutical Affairs Act went into effect and enabled us to outsource all or any production process. In 2016, its total production went over 622 billion yen and it led to the first place in Japan. Toyama Pharmaceutical Association tries to be a "Capital of pharmaceutical industry" with the hope of making the next leap forward by business cooperation with companies from other prefectures. The challenges include encouraging companies for commissioning manufacture by calling on faculties of pharmaceutical big companies, securing a stable source of manpower such as pharmacists, assisting for technology building, and co-distribution. As for boosting international exchanges, we have sent a group of people to Basel, Switzerland etc which is known for “Capital of pharmaceutical industry of the World” since 2006. Toyama Pharmaceutical Association has signed MOU with variety of Pharmaceutical Organizations. In this way, we try to activate and globalize our pharmaceutical industry through those efforts. Moreover, we try to develop the original brand products and promote all the products, hold PR events, commercial, and train for higher quality personnel. Those are for Toyama to have higher reputation as the capital of pharmaceutical industry. Toyama Prefecture has been manufacturing medicine for a very long time even before 1690, and its business model also has a long history. A long time ago, an accident made Toyama's medicine famous throughout the country. "Drug deliverers" have been visiting houses all over Japan for more than 300years to deliver medicines and feeling of safety for a comfort. The drug deliverer business came from the episode that had happened in Edo castle in the winter of 3rd year of Genroku, Edo-era, which was in 1690. One day, the feudal lord got acute stomach ache. The 2nd generation of Toyama domain head, Masatoshi Maeda, gave the lord a medicine named "Hangontan", which he always took around. All the sudden, the pain went away and the lords who saw what was happening impressed about the effect of the medicine. They started asking if the medicine can be sold in their domains. Toyama domain had hard time after a frequent flood disaster by the river, which led fragile financial condition. So, Masatoshi decided to execute "encouragement of new industry". He decided to instruct people to go another domain to make money by selling the medicines. These door-to-door peddlers were very unique and unusual at that time. Later on, successive domain heads kept trying to educate people for sorting out medical herbs and growing them along with establishing "Hangontan office". They worked hard to build the base, maintain and raise the Pharmaceutical business in Toyama today. 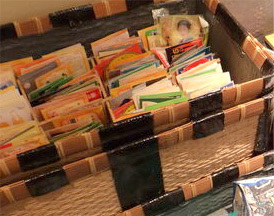 Thanks to its unique business style called "use first pay later" , which drug deliverer put many kinds of medicines in the box without charging at the first visit and charge the ones you used for the next visit, as well as the medicine's effectiveness, the pharmaceutical business has been coming down successfully. In those days, since the medical care was not popular, it was not common to keep medicines that you don't know when you use them. However, the style of the business (Use first pay later) was well accepted by the customers all over Japan, because of its convenience. Drug deliverers visited the customers regularly every year, which made their relationship of mutual trust strong, It was not a rare case for them to keep in touch as if they were real relatives. Customer file called "Kakeba-cho" has an important key, since it got written records of data about which customer use what medicines. Based on the data, drug deliverers could give customers health advices as well as putting appropriate medicines to each customer's box. 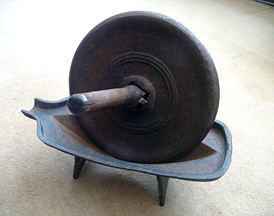 It became a model of the way of marketing.